It’s been a crazy month since the reboot of WP Remote went live. With quite a few releases and a bucket full of registrations, it’s about time for us to provide an update on what’s been happening with WP Remote. What have all these releases been about? One of our priorities has been to get WP Remote working well on mobile devices; the aim is to get WP Remote working well on most form factors. 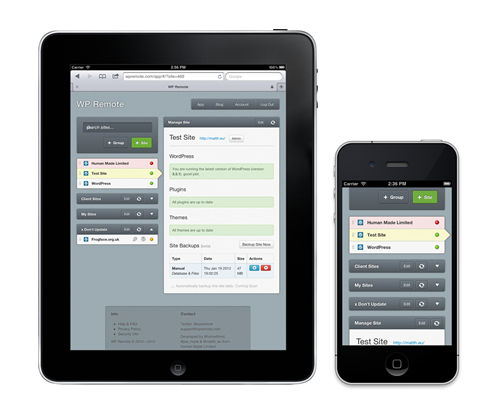 We have updated to Bootstrap 2 providing more capability for responsive design. Current progress sees the website working very well on the iPad and adequately on the iPhone with more improvements still to come. We’ve been focusing on making WP Remote more secure, this included changing to use unique API keys per site, you can also regenerate an API key for any site. As more and more domains have been added we’ve been amazed by the huge range of inconsistencies that can exist between sites. We’ve been working hard on compatibility, making WP Remote robust across a wider range of sites. We aim for it to be able to deal with any new site that is added. So how many people are using WP Remote now? At the time of writing we now have over 9,000 sites added to WP Remote – this is much larger than we could have imagined. The response from the community has been really great, we are thrilled people are making use of WP Remote. In best awards ceremony tradition we would like to thank everyone who has helped us to achieve this. We’ve had some great mentions from Joost de Valk (@yoast), TNW and WPMU, insidedaweb, the Loop, escolawordpress and Gregory Argenton that have helped more people discover WP Remote. Thanks also to everyone who has posted positive feedback on Twitter (@wpremote). It’s great to feel appreciated. What’s the latest on backups? The backup capability seems to be one of the most popular features but has also caused us some of the biggest headaches. We are working to improve backups and to be able to reinstate automatic backups. Going forward we remain strongly committed to investing in and developing WP Remote. The WP Remote app itself is, and will continue to be free to use, so no worries there. Carry on using WP Remote and of course let your friends know about it.